I popped along to a disability working group for cinemas yesterday and I was reminded that, however much I moan about cinema access, there have been big changes since I was a young person. And, compared to most other major countries, Britain is ahead of the pack. * 300 plus cinemas have subtitled facilities, around half of all cinemas. This compares to around 20 in 2003. Those that don’t, tend to be smaller, independent cinemas. Apparently, the UK is the only country in the EU that offers subtitled films on this scale. Not that there still isn’t a lot of progress to be made. Lots of subtitled films are still on only at the off-peak “graveyard” slots. “Technical problems” still crop up. And I still have a dream that one day I’ll be able to go into any cinema and ask for on-demand subtitles on any film. Encouragingly though, cinemas seem to be listening to these points, as the very existence of the disability working group shows. But, since I’m in a good mood today, I think it’s worth praising the cinemas for the progress made so far. Do you agree that things are better than they used to be? What progress do you want to see next? PS Just a reminder that you can see which subtitled films are showing in your area at yourlocalcinema.com. Funding for deaf access to cinema to be cut? I spotted last week that the UK Film Council are doing a consultation on their future priorities, and I’m glad I did. There’s no mention of access to the cinema for deaf children and adults in it. For a moment, I suddenly thought that we now live in a world where deaf children and young people can go and see any film they like with subtitles at any time whenever they like . But then I saw the pigs flying by the window and I realised I hadn’t missed an important memo somewhere. We don’t live in such a world and cinema access for deaf people, whilst much better than it used to be, could still be a lot better. So it’s pretty depressing to read that it’s not a priority for the UK Film Council. And it’s get worse. There’s no mention of funding for existing initiatives that aim to widen access. As I understand it, existing UK Film Council funding for the award-winning one-stop shop YourLocalCinema.com website is being cut. If I didn’t have access to the YourLocalCinema.com website, it would be a lot harder for me to work out what subtitled films are showing where. I probably wouldn’t bother in the end. On top of that, capital funding to allow cinemas to buy equipment to show subtitles is also being cut. In fact, according to the consultation, only around 0.5% of the UK Film Council’s future expenditure will go towards “diversity and inclusion”, and there is no mention of anything of direct benefit to deaf children and young people. Nada. I know I’m not alone when I say there is insufficient choice of subtitled films at convenient times at local cinemas. A lot of cinemas seem to think that deaf children’s schools are quite relaxed about them bunking off to watch a film judging by the times they schedule some subtitled films. Instead of making cuts, shouldn’t the UK Film Council should be looking at ways to widen access, by funding research into on-demand technology for subtitled films? The consultation closes tomorrow so if you’d like to respond to their online survey, you need to be very quick. NDCS’s response can be dowloaded from here. Be good to hear your thoughts. Are you surprised / disappointed that the UK Film Council are not making access to the cinema for deaf children and adults a priority? Leave a comment below to say what you think. Yesterday, I did something I’ve never done before – a media interview to camera. I have now recovered enough to recount my experiences. It wasn’t actually that bad in the end. It was for Your Local Cinema.com website and I was asked a few questions about how the website had helped me as a deaf person. I explained how as a deaf child I felt left out and excluded when my hearing friends would go to see films and I couldn’t because there would be no subtitles. I almost slipped in an anecdote about how I didn’t have a clue what had happened to Bambi’s Mum when I went to see Bambi as a six year old. And I spoke about how Your Local Cinema.com is a fantastic resource. Before the interview, I also got to practice my acting skills when I was asked to be filmed in the cinema pretending to enjoy a film. I will expect nothing less than an Oscar after doing my best faces for ‘highly amused’ and ‘overwhelmed by the drama’. All in all, an interesting experience and I picked up some media techniques. Inevitably, I thought of lots of things to say afterwards that I should have said. I also managed to stumble over my words at one point when I said “myself and other deaf children”. But, hopefully, it will all be positive effort in helping to promote Your Local Cinema.com and it’s importance for deaf children. And hopefully NDCS too, after I cheekily wore my purple NDCS t-shirt during the interview. A production company is putting together the material and will be sending it out to various programmes – so I’m not sure sure when it will be screened or if my piece will make the final cut – but will let you know. I was at a meeting a fortnight ago of a group that brings together cinema industry guys and representatives from the disability sector to talk about access to the cinema. It was a useful meeting and the highlight came right at end when the man from yourlocalcinema.com mentioned some new technology – subtitled spectacles. The idea is that you wear some special glasses and that the subtitles to the film come up on the inside of the glasses. So only you can see the subtitles. Apparently, RAF fighters already use a similar technology. The obvious benefit is that the subtitles would not be visible to other people in the cinema. Whilst the UK leads the world in accessible cinema, there is still a lack of choice of films at convenient times for deaf children and adults. Cinemas still tend to show films at ‘quiet’ times when hearing people are less likely to go for fear that they’ll lose too much business if they show such films at more popular times. Whatever the rights and wrongs of this, it makes me think that the existing model of delivering access will never deliver real choice. Hence my interest in technology that allows deaf people to see a film at any time of their choosing. 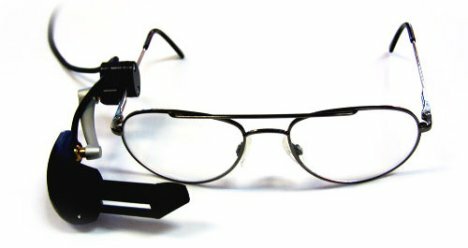 Has anyone else come across subtitled spectacles? Does it have any potential? Saw a story today which warmed my cynical jaded heart from This is Local London news. The young deaf person, Dean Rhodes-Brandon, behind yourlocalcinema.com website – which is a lifeline to all those wanting to know where and when they can watch films with subtitles – has won an award for his efforts, which was presented by the Chancellor. It’s great to see this achievement recognised. It proves that deaf young people can excel, just like all other children. And all the better that Dean has used his talents to widen access for all other deaf people. Although I have my occasional grumble about cinema access, I never had the option of going to the cinema as a child and now I do. I’m going to have a chocolate easter egg to celebrate.